Contour plots are used to draw contours of 2D images which can be read from a FITS file, a two-dimensional array, or given as a set of (x, y, z) points. 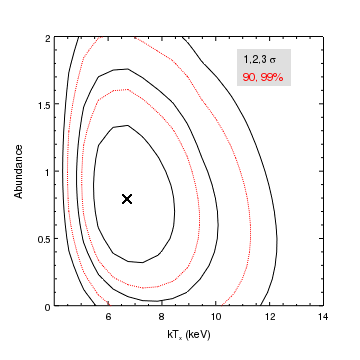 In this example the data is read from a file, where the image represents the statistic values from a fit of a thermal plasma model to a galaxy cluster spectrum (i.e. the results of a region-projection call in Sherpa). The add_contour call is used to create the contour plot; in this example we give it the file name, an array of contour values, and tell it to use the coordinate information in the image to label the axes. If the contour levels were not given then ChIPS would have created a set of levels based on the data range of the image; the levels used are accessible via the levels field of the object returned by get_contour, as shown below. For more information see the Controlling the contour levels section of the "Introduction to contours" thread. then the axes would have been labelled using logical coordinates, going from 1 to 21 on both axes in this case. The add_vline and add_hline calls create a vertical and horizontal line respectively; these lines will extend to the edge of the plot whatever limits are chosen for the axes. Note that the coordinate values used in these calls refer to the params coordinate system, so the call limits(X_AXIS, 4, 13) refers to 4 to 13 keV in this case. 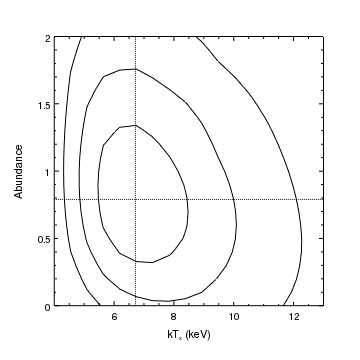 In this example, two contours are added to the same plot. The same image is used, since the contours are used to identify different sets of levels (the solid contours represent the one, two, and three-sigma levels whereas the red dotted contours are the 90 and 99 percent confidence limits), but the images could have been different. As with the first example, the levels are explicitly given and the "params" coordinate conversion is used to label the axes. Two labels are created, and then they are both changed to use a size of 14 by setting the label currency to all. In order to make the labels stand out a filled region is added to the plot, with a depth of 50 so that it appears behind the labels (since the default depth of items is 100). In CIAO 4.11, WCS support in ChIPS is only available for tangent-plane projections (e.g. images with RA--TAN and DEC-TAN images). Other projections - such as the SIN projection - will be displayed in physical, or logical coordinates. For the gallery plots, SIN projection images (such as provided by NVSS) have been converted to TAN projection - using a combination of the remap program from WCSTools and the Montage package. 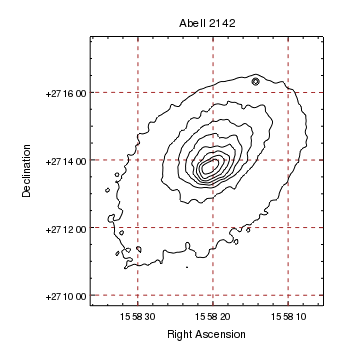 This example shows how a contour can be displayed using Right Ascension and Declination rather than "sky" or image coordinates. Since the image contains WCS information, as shown by the dmlist call below, the axes are automatically labelled using this coordinate system. To get sexagesimal format for the axis labels, we change the tickformat attribute of the axes to the values "ra" and "dec". As the data aspect ratio has been set by the add_contour call: e.g. then the plot limits are also changed, to maintain this ratio, when the plot area is changed by the call to set_plot. Since the source is at a moderate latitude the grid lines displayed by setting majorgrid.visible to True do not show strong curvature. The zoom routine changes the limits to display slightly more of the field. Using the add_ds9_contours routine from the CIAO contributed scripts package, we can also display contour files created by ds9, using its Save Contours menu item. This allows you to display the contours of an image that is not in the tangent-plane projection. 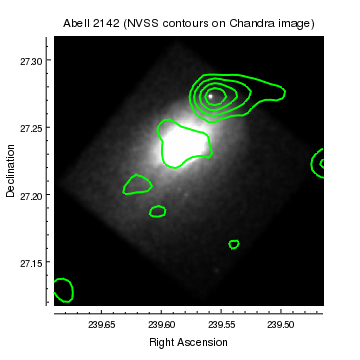 Here we use it to overlay contours from the NVSS survey, which uses the SIN projection, on a Chandra image of Abell 2142. The add_ds9_contours routine is provided by the chips_contrib.utils module, which is not automatically loaded by ChIPS. The Chandra image of Abell 2142 is displayed, and the pixel range changed to highlight the fainter emission. The remaining code just "tidies up" the plot, moving the axes slightly away from the plot so that the tickmarks can be seen, and labelling the plot.